Neverwinter Nights 2: Mask of the Betrayer is the first of what is likely to be a long list of expansion packs and adventure packs for Neverwinter Nights 2. Since it's an actual expansion pack, Mask of the Betrayer includes a whole host of additions: new classes, races, feats and spells, a higher level cap, subtle improvements to the interface, a 20+ hour campaign, and more. 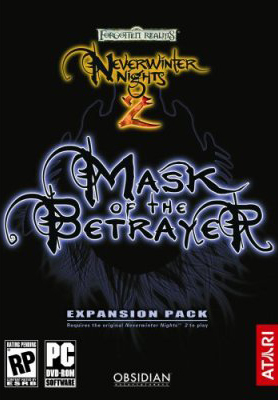 Chances are, if you're a fan of the Neverwinter Nights franchise, then you've already decided to buy Mask of the Betrayer -- or you've already bought it -- but if you're sitting on the fence, pondering whether you should wait for a gold / platinum / diamond pack to appear, then maybe my views on the expansion pack will sway you in one direction or the other. Mask of the Betrayer basically contains more of everything. Since it raises the level cap from 20 to 30, it includes new epic feats and spells for all of the classes (the epic spells are actually feats; spells still only go up to level 9), and it adds seven new classes and six new races. Since the original Neverwinter Nights 2 came with 28 classes and 16 races, I'm not sure how much of an impact these additional races and classes make, but some of them look fun. For example, the Red Wizard of Thay prestige class allows wizards to become even more specialized than they were before, and the Favored Soul class is sort of like a cleric who isn't required to memorize spells. Meanwhile, the races include four quasi-elemental genasi choices, each with an affinity for one of the elements (air, earth, fire and water). More options are always good, but there is also a limit to how many character types people are likely to play, and I think Obsidian Entertainment, the game's developer, has already moved past that. More likely to interest players is the expansion pack's new 20+ hour campaign. It picks up where the original campaign left off, but it is only marginally connected to it. The new campaign doesn't have anything to do with the King of Shadows or Crossroad Keep or even the city of Neverwinter. Instead, you find yourself in an old barrow with no memory of how you got there -- and worse, with a strange affliction that must be (fed) from time to time -- and you quickly discover that you have to find a cure for this affliction before it destroys you. As you progress through the campaign, you'll learn the fates of your companions from the original campaign (including meeting a couple of them again), but knowledge of that first campaign isn't really necessary. If you somehow didn't play it, or if you didn't save any of your characters from it, then you can create a brand new character for Mask of the Betrayer, and the game will advance it to level 18 and give it some equipment. The expansion pack also includes an assortment of pre-built level 18 characters, if you'd rather just jump into the action. The campaign itself is nice -- with all of the connotations, both good and bad, that the word (nice) engenders. Since you're trying to heal yourself, rather than hunting down and ending the reign of an evil wizard or something, the focus of the campaign is skewed a little, and so it plays differently than the other official Neverwinter Nights campaigns. Unfortunately, the companions you pick up during your travels are a little bit on the stodgy and boring side (imagine traveling with three Elanees in the original campaign), but at least they're also unusual, with a spirit bear and a dreamwalker among the possibilities. Companions don't really have side quests this time, but if you gain enough influence with them, then you receive special feats that give you bonuses. The dialogue and voice acting in the campaign are solid, so it's not troublesome to deal with your companions or listen when people talk to you, but the entire campaign is a little on the dark and dreary side, with frequent forays into the black and white Shadow Realm, and it takes a long time to (officially) learn anything about the affliction that you're trying to cure. I say (officially) because you're given so many hints during the campaign that you'll probably be way ahead of your character about knowing what's going on, and that gets frustrating after a while. I mean, late in the campaign you can actually ask who the Betrayer is -- after seeing the answer to that question maybe a dozen times up to that point. Perhaps the most interesting thing about the campaign is dealing with your affliction. You're sort of like a vampire who needs to (feed) from time to time to keep your energy up, but you're given a choice: you can glorify in the power of your affliction, or you can attempt to suppress it. Suppressing the affliction is actually easier, but using it gives you better rewards, and so the choice is not easy. Also, instead of playing a good or evil character, your decisions have more to do with feeding or not feeding, and that gives a unique spin to the quests. On the down side, your energy dissipates over time, and if it gets too low then you die. That's fine, at least in concept, but it makes it feel like you're being timed in the campaign, and I'm guessing that nobody who plays it will enjoy the feeling very much. I'm one of those players who likes to talk to everybody and explore every corner, and it's sort of disconcerting when the campaign keeps nudging you to hurry, hurry, hurry.